I don't care what nobody say, I wanna sleep all night and drink all day! Mean Jeans are a three-piece punk band from Portland, Oregon. They originally started out as a two piece band in Washington, D.C in 2006, with just lead singer/guitarist Billy Jeans and drummer/vocalist Jeans Wilder. Together they wrote their first song as Mean Jeans, “Party Animal,” which would later appear on their 2009 debut album Are You Serious?, released on Dirtnap Records. Shortly after joining forces, the band moved across the country to Portland, Oregon, and recruited bassist Freak Daniels to round off the Mean Jeans lineup. Citing New York punk legends The Ramones as a major influence, Mean Jeans make garage/punk music that's built on power chords and rapid beats—the majority of their songs are under two minutes long, and their 13-song debut album is just under half an hour in length. Lyrically, their songs make references to girls and partying, much like the Lookout! Records pop-punk bands of the early '90s, who they also cite as influences. Mean Jeans is currently touring around North America. Thanks to over 40 breweries located within its confines, Portland, Oregon has earned nicknames like Brewtopia, Beervana, and Beertown. Taking this fact into consideration, it's no wonder that a band like Mean Jeans calls this city home. The trio has been producing their own take on party punk since 2006, and make no apologies for their deliberately snotty lyrics about girls and getting wasted. 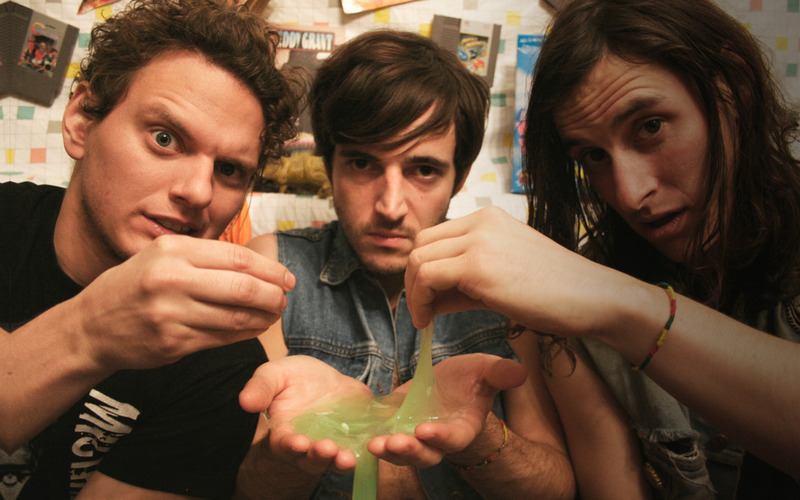 In fact, they seem to relish in it—their press pictures even show them holding green slime, and the artwork for their single “Steve Don't Party No More” shows a cartoon guy spewing green vomit with miniature tacos, guitars, booze, and a skateboard mixed in. Highbrow music, this is not. And that's exactly what caught our attention. While music with complicated compositions and poetic lyrics is always appreciated, sometimes you just need to strip away all the bells and whistles and blast a record that will make you slam dance to your heart's content. Their 2009 debut album Are You Serious? will definitely do that. In the vein of early punk pioneers like The Ramones and Buzzcocks, most of their songs are built on three power chords and clock in at under two minutes a piece. A rapid collision of guitar, drums, and bass kicks off opening track “Born on a Saturday Night,” setting the pace for lead vocalist Billy Jeans to spew out lines like, “I was born with a beer in my hand!” There's a brief call-and-response section of “Saturday night!” between Jeans and drummer Jeans Wilder, that you could imagine would incite a beer-fueled mosh pit to form in a tiny basement club. At just under a minute long, “Outta Smokes” is the shortest track on the album. The frantic tempo combined with Jeans' vocal delivery perfectly captures the feeling of going on a nicotine rampage once you realize that you're out of cigarettes. “Slime Time” starts off with more of a surf-punk feel, and channels The Ramones with plenty of “oh-oh's” and “whoa-oh-oh's!” Closing track “Let's Pogo B4 You Gogo” is a reference to the punk dance move of rapidly jumping up and down, like you're on a pogo stick. Lines like “Let's pogo before you gogo/ I can't believe you're leaving me behind” are the perfect sentiment for ending the album. At just under 30 minutes in total, it's almost as if Mean Jeans know that this is just the right length to blast the album in its entirety before the cops come in to break up the party.